Regulations for 25 kV electrification. After two years in the making, CPUC proceeding R1303009 appears to have produced the new rule book for stringing up high-voltage rail electrification in California, although the final document is still to be formally adopted by the Public Utilities Commission. 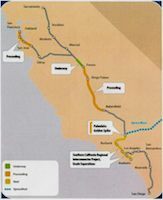 The final draft hammered out after numerous meetings by the high-speed rail consultants, freight railroads, utility companies and other interested parties thankfully bears little resemblance to the original draft proposed by the high-speed rail consultant, which was a mess. 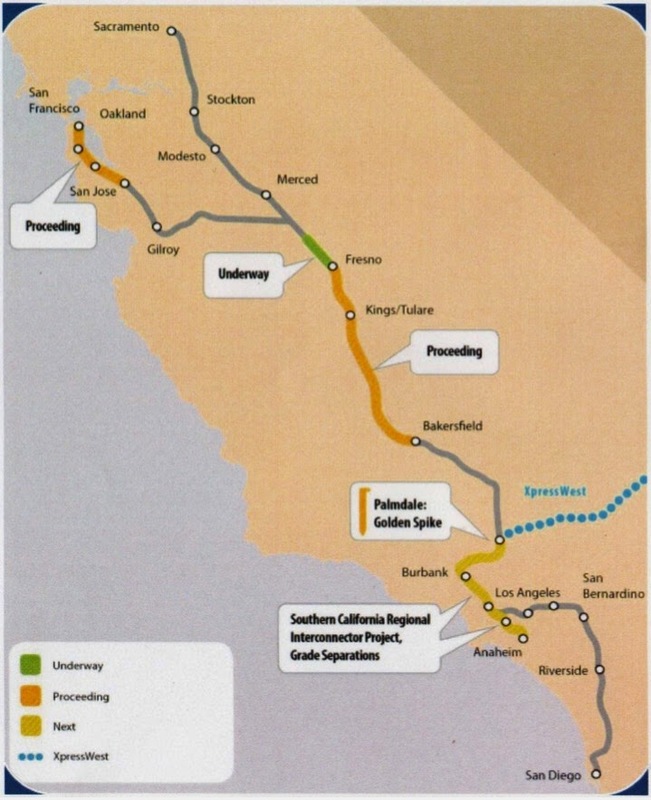 While the new rules apply only to dedicated high-speed rail corridors without grade crossings or freight trains, the language is flexible and there appears to be room allowed for parties such as Caltrain and UPRR to agree on those particular items on a case-by-case basis, without resorting to an entire new CPUC rulemaking process for the peninsula rail corridor. Most importantly, the new rules provide a clear framework that allows detailed engineering design of Caltrain's electrification project to proceed with a very low risk of future regulatory surprises. Grade separations. An unfortunate series of accidents and suicides have re-ignited the debate over grade separations in PAMPA (Palo Alto - Menlo Park - Atherton). This portion of the corridor abuts some of the most expensive real estate on the peninsula and is home to the most contentious and litigious environment for local decision-making (or lack thereof, as the case may be), and it is gradually dawning on these communities that Something Must Be Done. Grade separation is often misunderstood as an all-or-nothing proposition, when in reality it is a process that has been underway for decades. The peninsula rail corridor is already 62% grade-separated today. Communities up and down the peninsula are starting to talk more about finishing the remaining 38% of the job. Quiet zones. Palo Alto recently conducted a study session on quiet zones, which would stop routine horn-blowing at grade crossings. Curiously, the systematic use of train horns before every protected grade crossing is an American practice not usually seen in other countries, where crossing gates combined with visual and audible warnings are considered to provide a sufficient level of public safety. But then again, those other countries don't have lawyers like ours. The staff report contains a nice overview of the process for establishing a quiet zone; the main impediment seems to be the local community's assumption of legal liability for grade crossing collisions. New Caltrain CEO. Jim Hartnett was selected as Caltrain's new chief. He is a consummate local political insider with no background as a transportation agency executive, other than chairing the Caltrain board of directors and vice-chairing the board of the CHSRA. While he will no doubt be well equipped to navigate the choppy waters of inter- and extra-agency politics, he is less likely to shake up the Caltrain organization or to bring fresh outside-the-box thinking to the development of the "blended system." While Caltrain has plenty of political and organizational problems to work on, the technical aspects of blending will determine the success of the rail corridor for decades to come. Will Hartnett do anything about the top ten problems facing Caltrain, or will he just hold the current course?